I watched this movie 1 month ago but only manage to post this today as I have some issues with my life. As I ever said in my previous post, Takeru Satou is my favorite Japanese actor and Rurouni Kenshin is one of my favorite Japanese manga. So, I might really biased in my opinion. You have been warned^^. Ke ke ke. 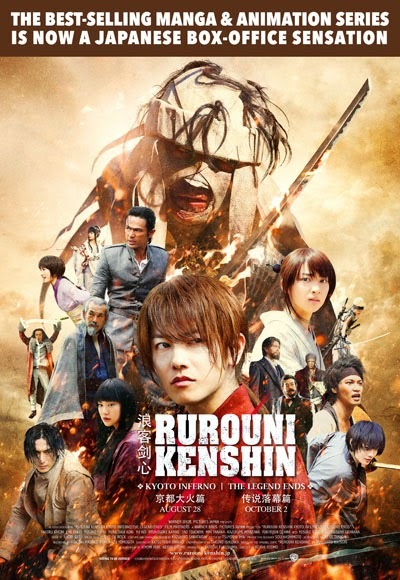 Rurouni Kenshin: Kyoto Inferno is the 2nd movie from Rurouni Kenshin live action trilogy. I love the first movie. But I can't help to think that non-reader or non-viewer of the original manga and anime don't have equal footing with the original fans. Being the 2nd part movie of a trilogy is problematic because it neither had the advantage of starting the story nor finish it. So it generally become the weakest in the trilogy. But it's not the case with this movie. You can watch it even if you haven't watch the first one or have no knowledge about this story before, because there's a plenty of flashback scenes. But you certainly have to watch the 3rd movie, The Legend Ends, because Kyoto Inferno's ending is rather awkward. Okay. First, let's talk about what I like from this movie. Takeru Satou. No need to explain why. Comic relief from Sanosuke Sagara. Everytime Sano on the screen, everyone in the theater are laughing. And his bickering with Megumi. I love that it is hinted in this movie that Megumi indeed have some feelings for Sano. Seta Soujiro. Ryunosuke Kamiki is perfect for the role. Saito Hajime. One of my favorite characters in the manga that shine in this movie. Hiko Seijuro. I nearly scream when they showed Masaharu Fukuyama on screen. I'm looking forward his acting as Kenshin's teacher here. The way they abruptly introduce Aoshi Shinomori. Maybe I'm a cold person, but the scene where that one boy crying because Shishio killed his parent and brother just not move my heart or make me sad. But maybe it's just because the acting and the set up. I remember crying hard while watching the opening scene of Guardians of the Galaxy (where child Peter Quill weep because his mother died). Overall, this movie is superb. I love it so much that I watch it twice a day. He he he. Japanese fans said that Rurouni Kenshin: The Legend End is 100 x better than this movie. Wow!! I'm really excited to see the last part of this trilogy!!! It will be screened in Blitzmegaplex, starting from 22 October 2014. I can hardly wait!